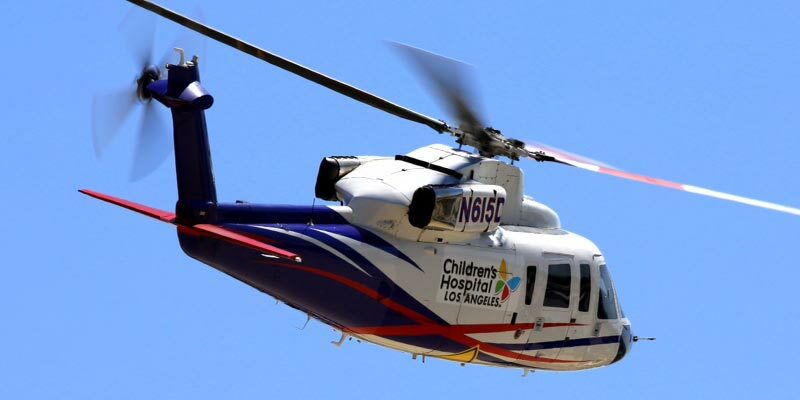 Since 1998, Helinet has served the greater Southern California community as the primary helicopter provider of medical transport for Children’s Hospital Los Angeles (CHLA). Operating 24/7, 365 days-a-year, Helinet’s two specially equipped helicopters transport critically ill children from across the region to CHLA for life-saving treatment under the care of the hospital’s pediatric specialists. The partnership began with Helinet’s initial donation of a Sikorsky S-76A to the Emergency Transport Program at CHLA to serve exclusively as an in-air ambulance. A second helicopter – a newer Sikorsky S-76B – followed in 2011. The helicopters along with pilots and maintenance are provided to CHLA completely free-of-charge. Each year, Helinet flies more than 4,000 patients for CHLA – some from as far away as Las Vegas – as part of one of the largest emergency transport programs in the United States. Helinet’s work with CHLA began after Helinet owner Alan Purwin was approached by Judy Sheriff, the hospital’s operations manager of emergency services. The hospital was looking to implement a helicopter transport program but was unable to shoulder the financial commitment necessary to develop and maintain such a service. As many of CHLA’s patients are not covered by insurance, the hospital could not rely on reimbursements for support. Helinet agreed to step in to fund the program, billing insurance when possible, but otherwise underwriting the costs itself. In the past 15 years, Helinet has transported over 6,000 patients for CHLA.